In Genesis 22, we see an amazing story of faith, of courage, of obedience, and most of all of GOD’s provision. Evangelist Dr. Karl Coke says that there are about 30 ways in which this story is almost identical to the story of GOD offering Jesus as the sacrifice for sins on Mt. Calvary. Read over Genesis 22:1-18 below, and make a list of all of the comparisons you find. Dig deep. Think hard. Ask the Holy Spirit to reveal them to you. When He does, sit back and marvel at GOD’s Word. And think about how important these truths are to your salvation, your eternity, and to your faith, courage, and obedience on a daily basis. 3 So Abraham got up early in the morning, saddled his donkey, and took with him two of his young men and his son Isaac. He split wood for a burnt offering and set out to go to the place God had told him about. 4 On the third day Abraham looked up and saw the place in the distance. 5 Then Abraham said to his young men, “Stay here with the donkey. 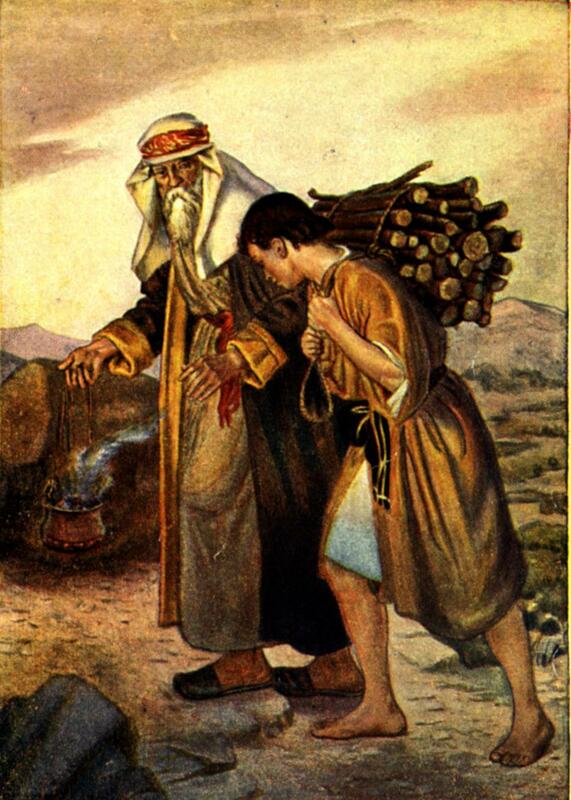 The boy and I will go over there to worship; then we’ll come back to you.” 6 Abraham took the wood for the burnt offering and laid it on his son Isaac. In his hand he took the fire and the sacrificial knife, and the two of them walked on together. 7 Then Isaac spoke to his father Abraham and said, “My father.” And he replied, “Here I am, my son.” Isaac said, “The fire and the wood are here, but where is the lamb for the burnt offering?” 8 Abraham answered, “God Himself will provide the lamb for the burnt offering, my son.” Then the two of them walked on together. If you find even ten or more, you are doing a good job of studying the BIble. God’s Word is amazing. This is why Jesus told the two guys on the road to Emmaus that if they really understand the Old Testament (aka, “the Law and the Prophets”) then they would see that He is the Messiah! Let’s learn from Abraham and Isaac about faith, obedience, courage, trust, and most of all… about Jesus. Jesus is the sacrifice that GOD provided — HIMSELF. Not only does God speak to us and teach us through His word but also to the various extensions and applications to our lives. The power of His word reveals the extent to which we see ourselves in the human lessons it provides. I’ve studied some of these in the past, but look forward to do it again. I love the fact that no matter how many times you study the Bible there is always more to learn and put into practice. And that Jesus is the hero of the story.